The Star Spectroscope is a diffraction grating that was manufactured by Rainbow Optics. We are told that these gratings are no longer being made. Over the years, many amateur astronomers have gotten good results with the Star Spectroscope. Our RSpec software works fine with any spectra, including those from a Star Spectroscope grating. The Rainbow Optics grating has 200 lines per millimeter. The more lines/mm, the more spread out (“dispersed”) the spectrum is. In some circumstances, the higher lines/mm can be helpful. But, there are two disadvantages when a spectrum is more spread out. First, the spectrum is dimmer, requiring more integration time. 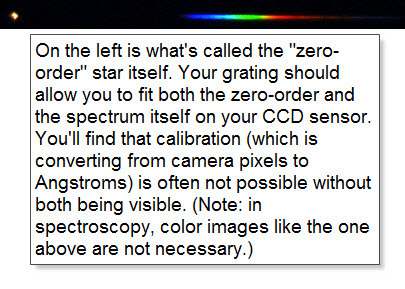 And, if the spectrum is more spread out, the star and spectrum may not both fit on your sensor, making it considerably more difficult to process the spectrum. In applications with close-coupled filter wheels, the distance from the camera to the Star Analyser is generally too short for the SA100 to perform well. This close to the sensor, the additional dispersion of the SA200 makes it more likely to yield the dispersion necessary for satisfactory results. Unlike other 200 line/mm gratings, the SA200 also has a low-profile design, plus an optional mounting kit, making it fit on a wider range of filter wheels than the SA100. On telescopes with a larger aperture and a longer focal length, the dispersion of the SA100 can be insufficient to achieve the best results. The SA200 produces longer spectra, making it easier to find settings which give satisfactory results with a larger camera sensor. You can read about the 200 lines/mm Star Analyser 200 grating at this link.